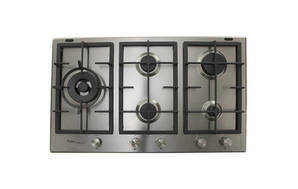 Snapshot: The Whirlpool GMF9522IXL gas cooktop has 5 burners and flame-failure protection. How well does it cook? Very good results in our stir-fry test. Very good burner layout (wok burner at left side, medium and simmer burners at front).